If your commercial space or home has wet and damp conditions, it can lead to a lot of problems. Dehumidifiers can help reduce the dampness by removing excess humidity. 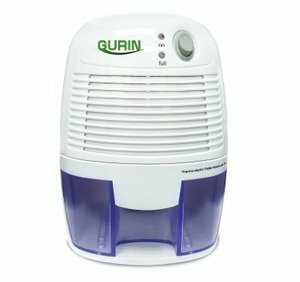 The Gurin DHMD-210 Electric Compact Dehumidifier ensures you have proper moisture levels in your home or office. Thermo Electric Peltier Technology – The dehumidifier works on Peltier technology and this ensures that it does not make a lot of noise when it is switched on. Most of the small models work on this technology. Energy Efficient – It consumes just 22.5 watts’ power. The unit has a power cord which is four feet long. This makes it easier to move around. Water Tank – The water tank can store 16 ounces of moisture easily. Compact Design – The small compact design ensures that it can fit small spaces like bathrooms, boat cabins, closets and RVs. The humidifier has a 16-oz. removable water tank. When the water tank in full the machine automatically turns off. The yellow colored LED bulbs turn on at this point. Removing the water tank is easy. All that needs to be done is to position the switch to off spot and then remove the tank to dispose the water. After the water is disposed you can return it and position it to on spot. Easy to maintain and clean. Just switch if off and unplug from the power supply. Clean the surface with a clean cloth and then clear the dry air outlet properly. The Gurin DHMD-210 has easy and simple power connections. Plug in the AC/DC power jack of the power adapater to the power supply. After connecting the supply just switch on the button to start dehumidification. The Peltier technology ensures that the humidifier does not make much noise when in operation. Comes with a renewable reservoir. Easily portable as it is a small dehumidifier. The capability to draw moisture from a room may drop after a few months. Optional water drainage methods are not provided. As these products are valuable investments, you want to buy only the best. The unit you buy not just has to remove excess moisture from your home but also fit your budget and specific requirements. Before you choose the product, there are many factors that you need to consider. 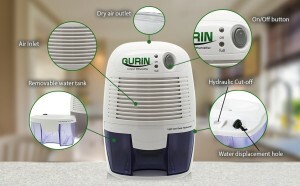 Price – A small humidifier is usually available under $100. A larger model can cost hundreds or maybe thousands of dollars depending on the type of features you want in the unit. Compare features and prices so that you can choose one that fits your budget. Never sacrifice quality for price. Water Reservoir Size – The size of the water reservoir depends on the size of the dehumidifier. If you have a large room, then you require a reservoir that can hold plenty of water. A unit equipped with an efficient drainage system is best for continuous running. Warranty – It is always advisable to buy a unit from a reputed brand that offers good warranty on the product. If there is a defect that affects the functioning of the unit then the warranty can help take care of repairs and replacements. Recommended Space – A small unit may not be able to clear the moisture from a big room or area. You need to make the choice depending on the space that needs to be cleared. A large space will require a large dehumidifier to clear the moisture in an effective manner. If the humidity is not removed properly, it can result in musty smells and mold. For more information about Gurin DHMD-210 Electric Compact Dehumidifier you can contact Gurin Products at (888) 666-1557.